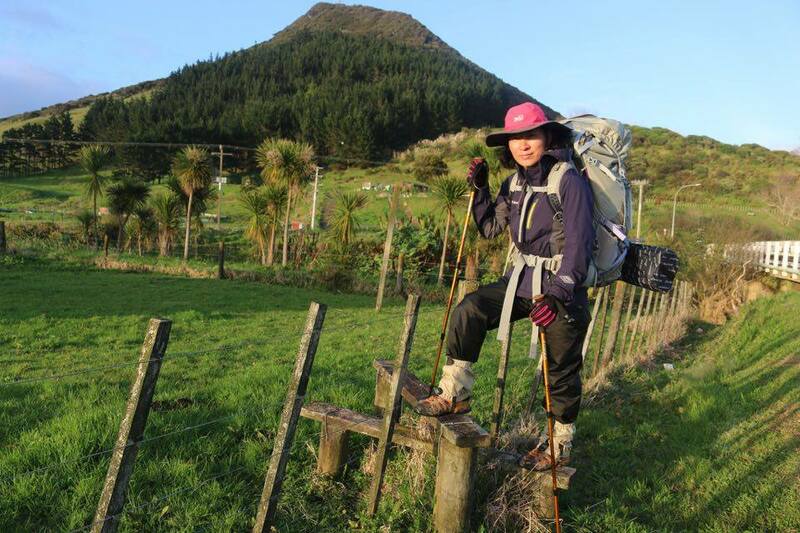 In late 2016 two CM hikers – Eunhwa and Stephen B – are undertaking New Zealand’s Te Araroa Trail: 3000 km from north to south. Here is Stephen’s log. Flight Christchurch to Auckland then onto Kerikeri. The flight from Auckland to Kerikeri wasn’t the best: pilot came over on the PA announcing that we were going to experience severe weather: thunder, lightening. And the worst of all, he said we were going through the centre of it. No drinks served and he was right, it was rough. On arrival the bus driver that took us into Kerikeri said that we were lucky to make it, as in another 10-15 minutes he reckoned we would have been turned back or cancelled before we even left. First job while waiting for out next connection to head to Cape Reinga was fuel for our cooker and lunch at the local Subway. We had all our food supply to last us a good seven days if not more. That is thanks to Eunhwa’s family in Korea. It is dehydrated Korean food where you just poor hot water up to the water line in the container and five minutes later you have a decent meal. 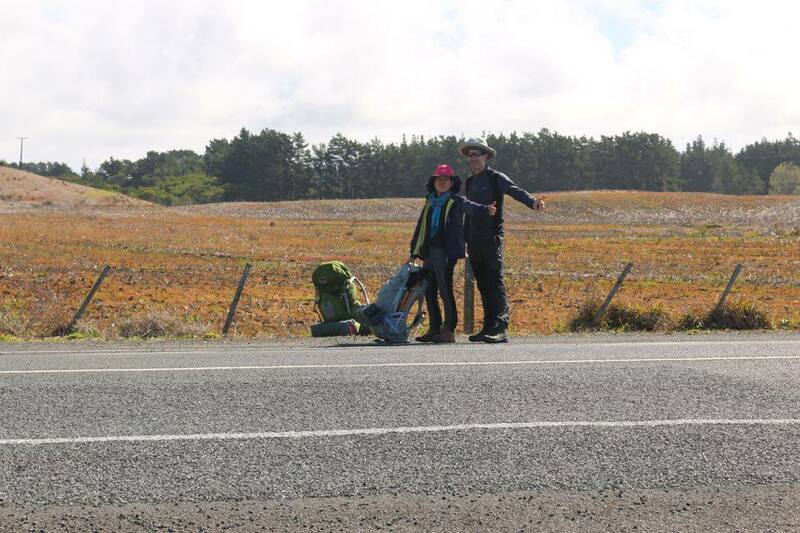 Two hour wait for the connecting bus to get us to the major junction at Awanui and then we plan to hitch hike to Cape Reinga. Would have preferred a direct bus to our starting point, the most northern point of New Zealand, but this seemed only available in tourist buses that leave first thing in the morning. So what to do in Kerikeri, the town we will visit again in two weeks time while on the Te Araroa track? Probably not much except hang out at the Subway or at the many coffee shops, avoiding the rain. Sure there’s probably time to do the Bay of islands, but the best we could do was observe the balancing rocks across the road where I counted 14 on top of each other. Bus from Kerikeri to Awania and there we were, standing on the side of the road with our thumbs out waiting for a lift direct to Cape Reinga. Our first day was a bit unknown with water supply, do we fill up now and carry 3-4 litres of water each or hope that there is going to a water supply up there. The information shop was closed so we just carried water for the day in our bladder bags just a litre each. Turned out to be a slow day, with four lifts we only got half way and it was only locals that gave us lifts with the many camper vans passing us by. Interesting talking to the locals and their concerns and what was coming up the most was that countries like China come over and “spelling” our resources like dairy, trees and even groundwater then ship it straight out of New Zealand with minimal benefit to the locals in their area. And then about immigration and lazy youths. Our final stop, where we waited for our a couple hours was Potahi. We finally gave up with no traffic coming and made our way to a local rugby field where we camped in the corner near some bushes, hidden, well that’s what we thought. After cooking, our dinner – bibimbap food from Korea just add water as surprisingly it was really nice and filling with rice, vegetables, sesame oil and chilly paste and yellow bean soap. All done in two packets which you add water to them hence no dishes. Just as we were finishing dinner, a lady drove up saying we were camping on Maori land and she was a trustee of the land. After we apologized many times, we were told to pack up and luckily for us, she must have had a kind moment and told us we could camp on her front land. Our first night sleep for me was very uncomfortable: hard ground and no pillow. 7 : 30 am we got packing and headed for the road to hopefully catch the morning traffic. 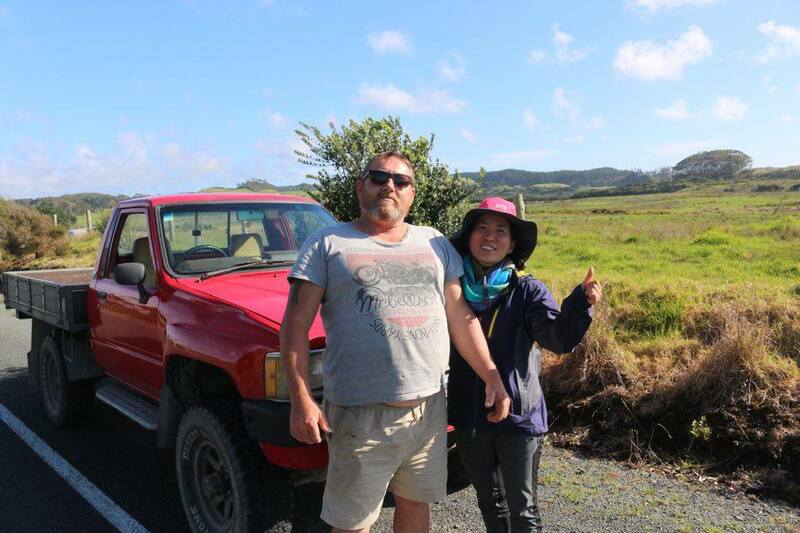 Got our lift 10am by an English young couple in a campavan they purchased in Auckland for 6,000 NZD. Their plan is to travel for 12 months, and find a place to maybe stay and work for 3 months, then maybe consider living here for good. 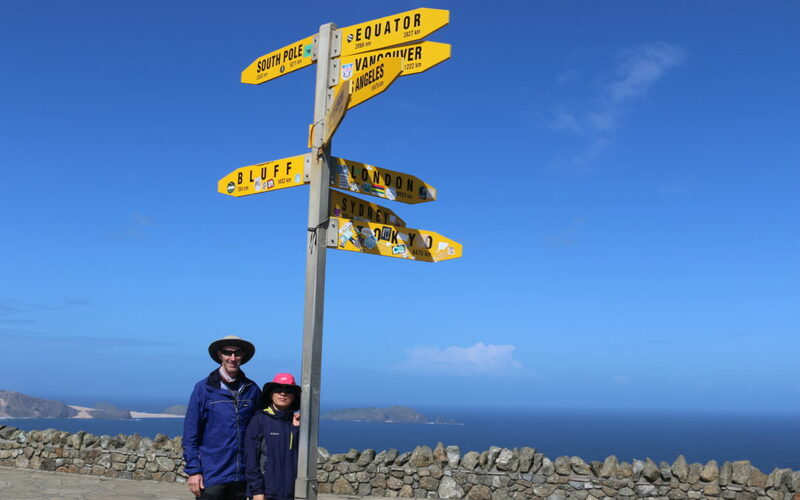 We started Cape Reinga at 11am. Within the first hour we stopped and had lunch or breakfast – our first meal for the day – while we waited for the tide to go out so we could continue walking at low tide on the beach. Camping at Twilight Beach: We walked 14km for the day, arrived at 4:40pm. Tank water available with two toilets and cooking area with shaded tables. Great place in the event of rain. 9 people on our first day at the campsite (one American woman that talks a lot, couple NZ, couple Scottish, rest New Zealand). Funny thing: we were the first to reach the camp site and found a travel book, big and heavy, along with a large bag of oats, apple and biscuit: obviously they had carried too much and dumped stuff to reduce some weight, the book alone must have been a kg. Sleep early, just as the sun sets and we watch it happen from our tent overlooking the sea. We definitely carried too much food: my backpack must be at no less than 20kgs or over, doesn’t help that we filled up with 4 liters of water each, and enough food for 10 days. 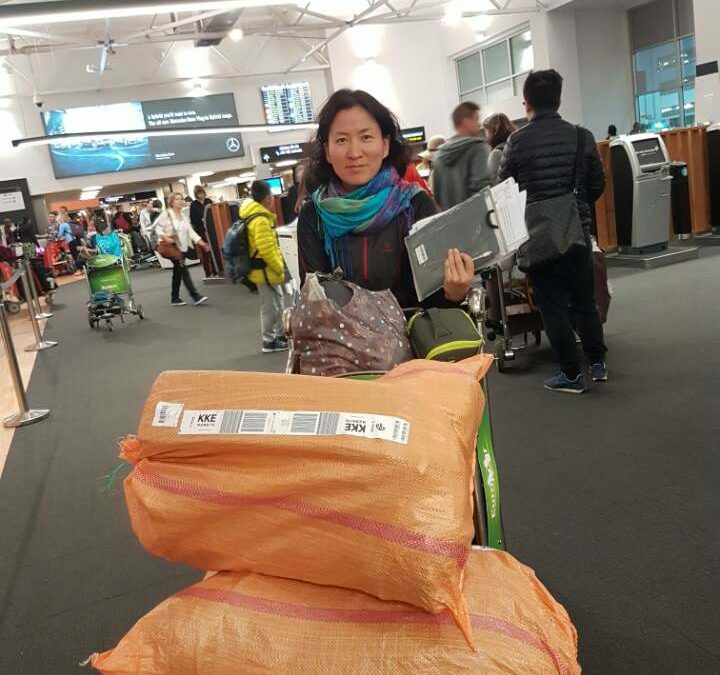 All this because it was gifted / sponsorshipped to us – and enough energy bars for two weeks. 40km completed. Today we walked 26km from Twilight to campsite. Today was tough, really tough, my while body aches from my heavy backpack. Eunhwa had problems with her knee but she worked through it. Out of 8 people we were the last to arrive: late at 18: 15 with a start time 8:30. My hips are screaming out from pain. It was worse after a 10 minute rest and the pain was unbelievable but if Eunhwa can do it with her knee problem, I had to too. Most of the way was high tide which means we had to walk up away from the water and into the soft sand, pain for me behind the knees and calf. Great day weather wise, but Eunhwa was in much pain: her blisters on the pad of her foot were filled with liquor and blood. She screamed with pain and at times just wanted to throw in the towel and give up for the day. Midday we rested as the high tide was forcing us to walk onto the soft sand which really slowed us down and made for tiring work. 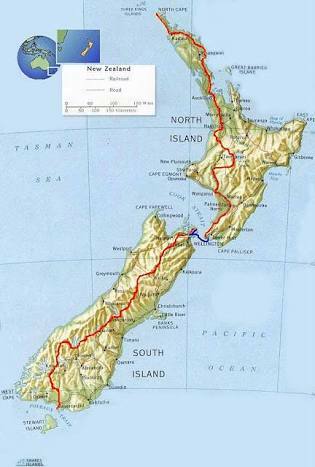 For an hour we rested with an elderly couple in their 60’s that have taken on the Te Araroa challenge but with a larger time frame than us: 6 months. And lucky for them, they have a backup/support crew travelling north to south with them in a Camper Van. As we laid there resting, naturally we fell asleep. That was until Eunhwa screamed at us to get up quickly. The tide was certainly coming in and as I grabbed my backpack the wave had just damped my camera case: fortunately not enough to get my camera wet. My feet were also getting sore; new boots that haven’t been worn in were the problem. These were mail ordered from America and were the exact same type and size as my other pair and they fitted like a glove from day one. We made it to the camp site. It was a paid site this time of 10 dollars per person if in a tent, and it supplied kitchen, shower and water. But strange Eunhwa didn’t want to stay (it was only 250 bath each, I said), so we carried on for another one km then found a nice sheltered spot in the sand dunes where we set up camp on soft vegetation. 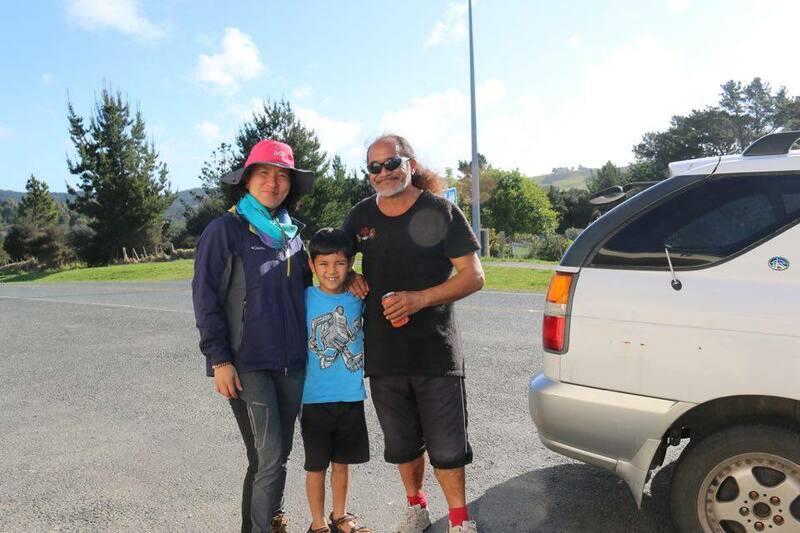 Later, Eunhwa said that she got the conversation of the currency wrong and thought it was much more expensive and the new camp site was just taking advantage of the Te Araroa walkers. We decided to head off early the next morning so with the alarm clock set at 5am we both crashed, waking only occasionally with the rain and wind hitting our tent. 7am start and not long after that the rain came down. Panic to find our weather clothes and we were really lucky that the wind was to our back and pushing us along the beach. Very difficult day for Eunhwa especially after 3pm when her feet were killing her. The days become unchanged as the views of the once lovely beach become a repeated unchanging view of sand and more sand. 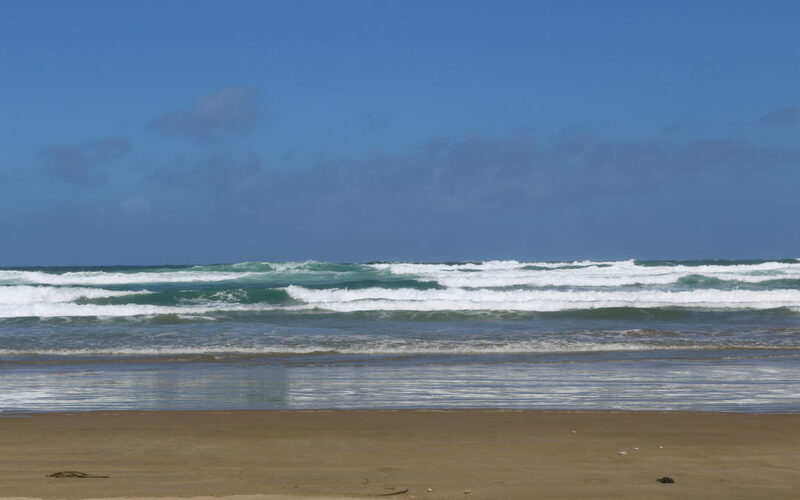 Rest day at YHA Ahipara, posted camera to Christchurch save weight 700grams, great fish and chips and generally lazy day. Day 7 – Saturday 8th October – The toughest section? Early rise and hit the road at 7am. Pleasant walk before the Herekino Forest which has the reputation of being the toughest section of the entire Te Araroa track. Been told that we will have mud up to our knees and the chance of losing the path was high. 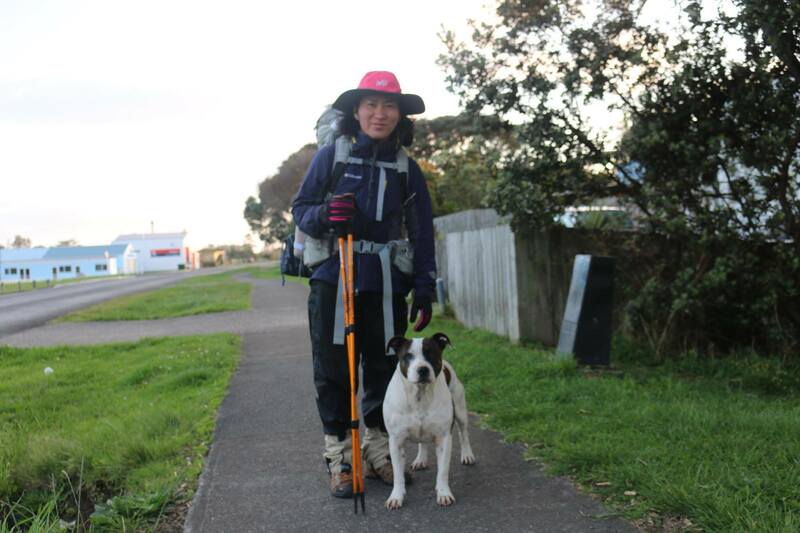 From Ahipara town, where we stayed for the night, a friendly dog built like a bullmastiff, the type no-one would go near, followed us the 9km to the start of our forest track: very friendly she was. We tried to shoo her away and get her to return home as she continued crossing the road with the risk of getting hit by a car. Possum high in the tree was safe from her but that didn’t stop her from trying. Just before we got to our turn off, the dog crawled under the wrong wire fence and – with a yell from getting a shock from the electric fence – she dashed across the road then looked at us as if we had something to do with it. Then she was gone. I could see straight away that the track was going to be a challenge from all the water lying about. We rested for 10 minutes and finished off the hard boiled eggs, and with new energy from the rest we had yesterday we made our first climb into the hill. Going was much easier than first thought; the weather was definitely on our side with nothing but blue sky everywhere, a great contrast from yesterday. We got to the stream where a wire was strung from side to side to assist hikers across in the event that the water was too high. Today it definitely wasn’t needed. Scott and Mandy – Scottish friends we met when we walked on the beach – caught up with us. Feedback from others meant we all knew that it wasn’t going to be an easy day. So off we went with our water bottles filled from what we were told was the last clean water supply. Although we didn’t see them, being a Saturday, there was obviously a team of workers clearing the track wide enough for two people to walk side by side and this carried on for at least a couple of kms. Going down the ridge line towards the farm land was a real challenge with mud/clay making progress very slow. On exiting the forest at about 6:10pm we had enough food for dinner and breakfast. We came across two boys from England already camped. They informed us that the best option was to camp alongside the access road between forest and farm. I admired their tents – they had one each -which were very different to our one. First, theirs weighed 0.6kg compared to ours being 2.1kg. Admittedly theirs was lighter because of having only one skin to protect yourself from the bugs, sandflies and rain. But I liked the weight difference: carrying just over half a kilo is more attractive than lugging around 2kg of dead weight. No wonder my bag was heavy. 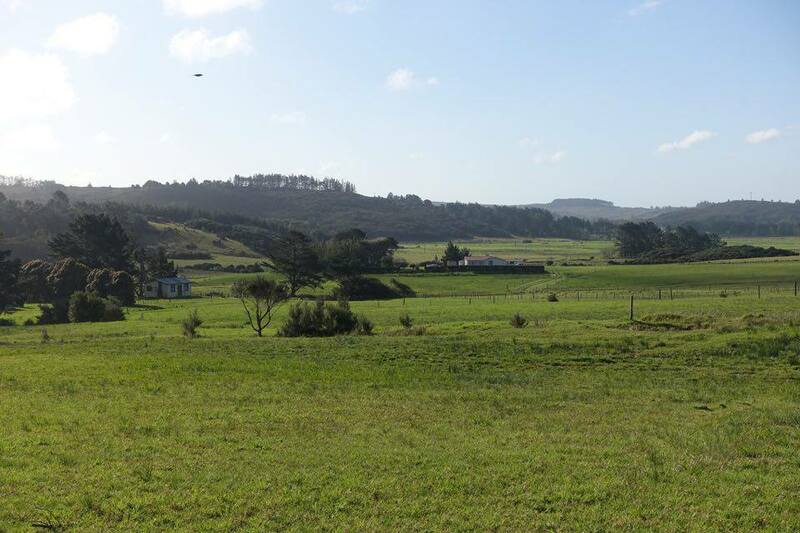 After talking to the two boys, we backtracked 50 metres and found a great spot with a view of the farm land with the milking cows obviously getting ready for their milking. Dinner was basic with most of the Korean boil-in-a-bag gone, we were down the quick rice and chicken powder from the first day of the trek. 90%of the food was brought from overseas at a fraction of the cost of what I’d expected to pay in NZ.